This hot bowl of steaming and hearty soup is great for any cold, chilly day, and would be great for nursing a cold as the vegetarian version of "chicken noodle soup." The recipe is very simple and has few ingredients, which does make for an unfortunately bland flavor, but you can doctor it up with spices or other additions. As is, the soup has a mirepoix base (chopped onions, carrots, and celery) which is sauteed in olive oil; vegetable stock and salt and pepper are then added and simmered. A pinch of turmeric is also added, but I think this is simply for color, as the taste is very mild and doesn't really come through. 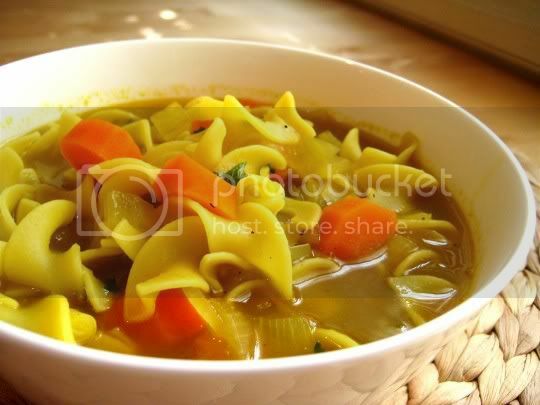 Egg noodles are added toward the end of cooking, and the starch from the noodles thicken up the soup considerably. Fresh minced parsely is added at the end, giving the soup a slight herbal essence. In the end, you've got a simple but hearty, sort of bland but slightly sweet (probably from the veggies, or maybe the stock) hot and filling dish. Make again? Maybe, with LOTS of extra seasoning, or some seitan "chicken" chunks. "Home-Style Noodle Soup," The Vegetarian Meat and Potatoes Cookbook, Robin Robertson. Boston: Harvard Common Press, 2002.